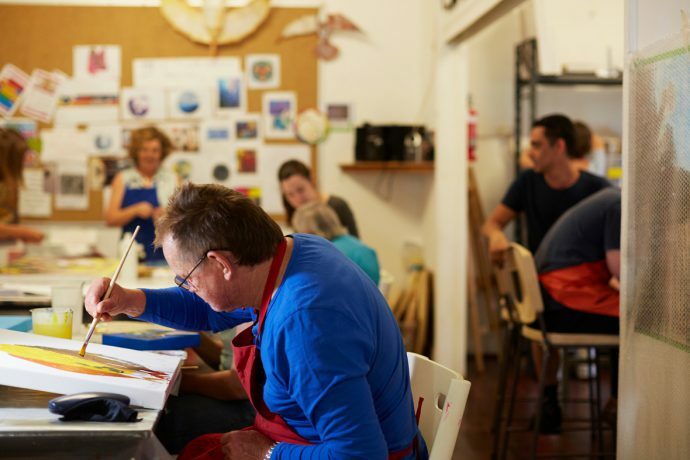 Serving the Eastern Metropolitan and Perth Hills area, DADAA Midland is offers a rich program of workshops, exhibitions, mentorships and community outings. Social Support: For individuals to stay active by visiting arts and cultural destinations, keeping appointments and doing recreation activities. Transport: Group and individual transport to access the community and attend community events. Advocacy: With health partners, such as Silver Chain, OTs, GPs and mental health services such as Partners in Recovery, MIFWA, Headspace, 360 Health + Community and Richmond Wellbeing. The Flight Art Studio in Stirling is run by DADAA Midland as a joint project between DADAA and HaCC. The Flight program offers art workshops for adults who wish to access opportunities to create, exhibit and sell their artwork. Workshops in visual arts include drawing, painting, sculpture and ceramics. The program is open to the general community and people of all abilities. DADAA Midland uses Midland Junction Arts Centre (MJAC) for some of its arts and dance workshops and activities – including, but not limited to, Tracksuit and On Track.